People who actually work hard and succeed in what they do rarely think there is anything special about themselves. People who actually work hard and succeed in what they do rarely think there is anything special about themselves. 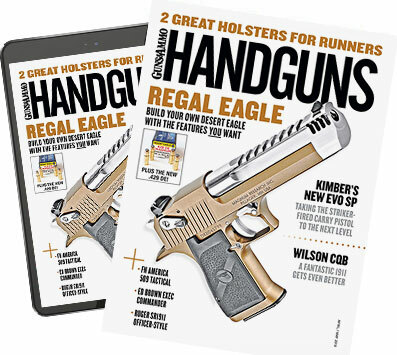 Aaron Roberts, now in his third season as co-host of "Handguns TV" on Sportsman Channel, didn't really think an article about him would be very interesting. "Everybody's heard people talk about their backgrounds," he says, "and mine's no different than anybody else's." Coming from somebody who has been a U.S. Army Ranger, a Texas State Trooper and a head tactics instructor for Blackwater, that's a very interesting statement. Roberts grew up in Texas, and hunting and guns were a part of his youth. When he got out of high school he joined the Army. Half his time was spent in the 75th Ranger Regiment, the other half as part of a long-range surveillance team with the 10th Mountain Division. "We worked in small, five- to six-man teams," he explains. "Our role was to go forward of friendly troops and do surveillance and reconnaissance." When he got out of the military, he went back to college in Texas with the idea of completing his degree but had a really hard time sitting in classes, "listening to a bunch of 18-year-olds. I got to the point where I really needed to start doing something." That "something" was becoming a Texas State Trooper. "Between getting out of the military and going back to work for the state, I started shooting competition," Roberts says. "I shot a little bit in the military but didn't have time or money to really go after it too much." The experience wasn't what he expected, given his level of experience with handguns. "When I first decided to go to a match, for about a week I was thinking these people do not understand what whirlwind is about to roll into there and start smashing them," he says. "But, like a lot of people have experienced, you show up and it doesn't quite work out that way. "You realize that the best shooters in the world are not in the military, and they're not in law enforcement: They're civilians. It's because civilians care, and they're spending their own money. I didn't finish last at that first match, but I didn't finish first, either. And people typically take that one of two ways: One, 'Oh, well, you know, that's BS, it's not real,' or two, 'That's an eye opener, maybe I need to practice.' " Roberts practiced. "I started shooting and fell in with some good folks, and in a fairly rapid amount of time I was winning regional and state championships, going to the national matches and finishing in the top 10 overall." Roberts prefers the simplicity of IDPA to the gamesmanship of USPSA competition. A short time later he was offered a job at Blackwater. At first he turned them down, but they came back four months later with an offer for him to work as a full-time firearms and tactics instructor. He thought, "Well, that has a cool title, but it can't be as cool as the title sounds." One trip to the Blackwater facility and he took the job. "I go there and started outshooting everybody, and so they started implementing stuff that I was doing. I founded the Blackwater Shooting Team and was the captain of that. By the time I left in 2009 I was one of the lead staff firearms and tactics instructors." His association with firearms trainer Larry Vickers led to a co-hosting role on the show "Tactical Impact" and from there came on board with "Handguns TV," now in its third season. These days, Roberts is living in the Houston area and operating RP Rifles--building high-end custom bolt guns for the hunting, tactical and competition crowd--and also operates his own firearms training company, Tactical Shooting Solutions.